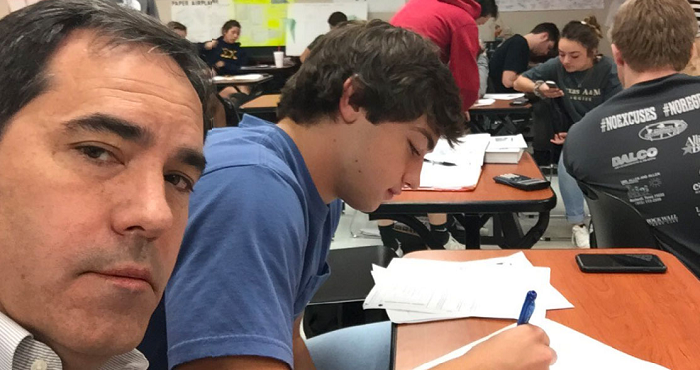 When Bradley Howard received yet another email from his son’s physics teacher, he knew that he needed to take drastic measures to get his son to learn an important lesson. His son, also named Bradley, had been acting out in class and his teacher had nowhere else to turn. The teacher sent an email, and Mr. Howard agreed to talk to his son. Unfortunately, it hadn’t worked. Bradley was still acting out, and after several complaints from the frustrated teacher, Mr. Howard warned his son that if he received another email about Bradley’s behavior, he’d be going to class alongside him to make sure that Bradley paid attention. And then one day, it was time to show Bradley son the consequences of his actions. Mr. Howard was woken up by his wife one Friday morning with the instructions that he would need to go to school to meet his son. It was time to make good on their promise. And so, in a move that some parents call “brilliant” and some call “too far,” Mr. Howard went sat uncomfortably close to Bradley as the students learned all about physics. Mr. Howard wasn’t happy about having to babysit his own son, and so he sent this selfie to the family’s group chat. Molli, Bradley’s sister, tweeted the embarrassing picture on Twitter were it took off! People couldn’t stop laughing at poor Bradley’s fate! Hopefully, he has learned a valuable lesson!